The family of a World War Two veteran have complained he was moved 13 times in various hospitals during the last 10 weeks of his life. Reg Thompson, 94, was admitted to Leicester Royal Infirmary (LRI) after a fall at home on 21 December and died at Kettering General Hospital on 2 March. Mr Thompson spent time on different wards at five hospitals before he died. The University Hospitals of Leicester NHS Trust said a complaint into his treatment was being investigated. 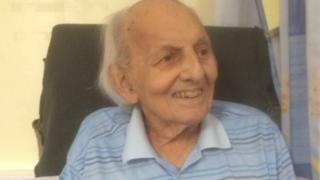 The Local Democracy Reporting Service said tests found Mr Thompson, who lived in Oadby for 59 years and served in the Royal Navy during World War Two, had a chest infection when he was first taken to A&E. He was discharged from a rehabilitation ward at Leicester General and sent home on 8 January, but was admitted to the LRI again with pneumonia two days later. Mr Thompson was then passed between the LRI, Melton Mowbray Hospital and St Luke's Hospital in Market Harborough before his death at Kettering General Hospital. Brian Winterton, Mr Thompson's nephew, said: "If you suggested this as a storyline in a soap it wouldn't get through, it's just so unbelievable. "Every time he was admitted to a different place they talked about getting him back to the base line, how he had been when he came in, but he was getting worse every time he moved." Moira Durbridge, director of safety and risk at Leicester's Hospitals, said the complaint was "very complex" and involved two other organisations. "His family can be assured that we take their concerns very seriously and will be responding to them in detail once we have finished our investigation," she said. A spokesperson for Leicestershire Partnership NHS Trust, the organisation in charge of the county's community hospitals, said it would "welcome the opportunity" to discuss the complaint further with the family "so that we can investigate it".